What Are You Doing To Prepare For The Busy Season? As employers prepare to vie for qualified candidates during peak hiring times, delays in the on-boarding process can prove detrimental to organizational staffing needs and their bottom line. According to a recent study released by Indeed, 61% of 1000 respondents are expecting to hire more people in 2018 than they did in 2017. What does this mean for recruiters? In today’s competitive hiring landscape, employers are competing to find reliable candidates fast while providing a safe, drug free workplace. While employment rates seem to be climbing, drug use in the workplace continues to climb with it. According to Quest Diagnostics 2018 Drug Testing Index, drug use by the American Workforce remains at its highest rate in more than a decade. As a result, more and more organizations are adjusting their pre-employment drug testing protocol to gain a competitive hiring advantage. It has become all too familiar to hear customers that were using traditional collection site and lab based drug testing, report their frustration in which they call a candidate 2-3 days following a negative drug test result from a lab with a job offer, only to have the offer declined because they have accepted a position with another company that came their way more quickly. During busy seasons when proper staffing is pivotal, companies cannot afford to lose qualified applicants to competitors who are able to offer onsite drug testing and immediate job offers. 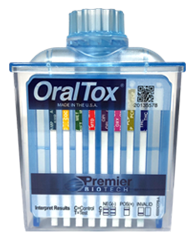 Premier Biotech’s rapid oral fluid test OralTox®, delivers an innovative solution for pre-employment testing saving money and time compared to both collection site and lab based drug testing. OralTox provides a solution for an immediate result and job offer on the spot following a negative result. One case study conducted by one of the world’s largest staffing companies indicated that over 70% of candidates that were sent to a collection site for a drug test, post job offer never showed up at the collection site because of difficulty in transportation, ability to walk down the street and get another job offer with onsite drug testing, or they showed up at collection site to find a 45-60 minute wait and decided it was not worth it. Another advantage OralTox provides is the ability to eliminate chain of custody forms for any negative screen results. Only the small percentage of inconclusive (non-negative) results will require additional paperwork to be completed by the collector. Consider the following return on investment for a company doing 200,000 pre-employment tests annually. With traditional testing without the use of OralTox, the company is required to complete 200,000 chain of custody forms. If each form takes approximately 2 minutes, that is 6,666 staffed hours required for filling out forms each year. Additionally, forms not completed with 100% accuracy require additional time in submitting affidavits and corrective action required between the collector and the lab in order to proceed with testing. By making the switch to OralTox, companies can allocate this time back into staffing hours. When compared to traditional laboratory collection testing, Premier Biotech’s OralTox provides employers the ability to capitalize on the many benefits making the switch to rapid oral fluid testing provides. Faster testing for multiple drugs simultaneously, quicker hiring decisions providing a competitive recruitment advantage, and industry leading detection.